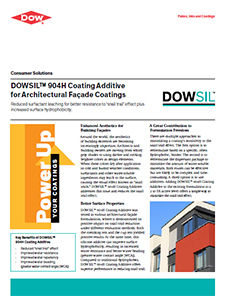 DOWSIL™ 904H Coating Additive by Dow is a BTX-free functional polydimethylsiloxane. Acts as a water repellent and hydrophobing agent. Provides improved water beading and snail trail resistance in high PVC, dark colored paints. Used in architectural facade coatings. Complies with EU DIRECTIVE 2010/75/EU. Recommended usage level of DOWSIL™ 904H Coating Additive ranges from 2.5-5%. It has a shelf life of 700 days at <50°C.